Next meeting is May 4th at Panera Bread at 6:30. (Note this is a Tues). Those attending April meetings:Bruce Hayes, Jerome Goolsby, Teresa Fankhauser, Cindy (Daniels) Winger, Gloria (Lopez)Bears, Donette (Silcott) Smock, Kevin Kiner, Brenda (Akins) Callen, Rick Roberts, Mark Shepherd, Roger Sager, Pete Walker, DIANA (KEENEY) JONES, MAX RUSSELL, and Kathy(Snyder) Hughs. Janet (Lawson) Ries attended via SKYPE. WOULD PREFER YOU REGISTER ONLINE (GO TO TOP LEFT 35 YEAR REUNION) PLEASE REGISTER EVEN IF YOU ARE NOT ATTENDING! IF YOU HAVE NOT BEEN ON THIS SITE BEFORE, GO TO MISSING CLASSMATES AND CLICK ON YOUR NAME! We will want to start collecting money starting now. $30.00 a person covers both nights-what a deal!!! ($20.00 if you can only attend one night). Questionaires are out and if you know of anyone that has not joined this site please have them do so! Please send checks to LHS 1975/Kathy Hughs, 12554 County Road 363, St. Joseph, MO 64505. If you have any questions, please call 816-351-4695. (due to new banking stuff and since we do not have a tax id #,we can't have LHS 1975 as the name on the account..ugh!) Pictures will be on Saturday night, approx 6:30. Cost is $10.00 for a 8x10 class pic and grade school group pics will be 5x7 for $ 5.00. Hotels: We seem to have trouble with getting good rates unless we actually book rooms. However, Teresa has gotten 10 rooms blocked at Holiday Inn for $72.00 a night..Reservations must be made by June 4th. 816-279-8000. This is the one downtown 3rd & Felix. Other hotels available: (Check to see if they have military, AAA, or AARP (cough,cough) discounts if applicable. SET YOUR CALENDARS! Reunion Dates have been set to June 18-19, 2010. We will have our Friday icebreaker at KOC and Saturday will be at Cindy Winger's. (THANK YOU CINDY!!!). Bruce has been gathering items so we can have a Memorial Area for our classmates that are no longer with us. Anyone that has any items or photos of those classmates that we may borrow, please let us know. I will have an official list soon of people that we do not have addresses soon. If you know of anyone that has not registered on the site, please have them do so. If they do not have an email address, have them contact me, so their information can be put into the system and they will be taken off the site missing list. Diana Keeney Jones is in charge of the cooking for the reunion. Jeannie Klawuhn Nordstrom is our decorating person. The rest of us will be gathering all other info, so we can have a price of the reunion. IT WILL BE WELL WORTH IT!!! 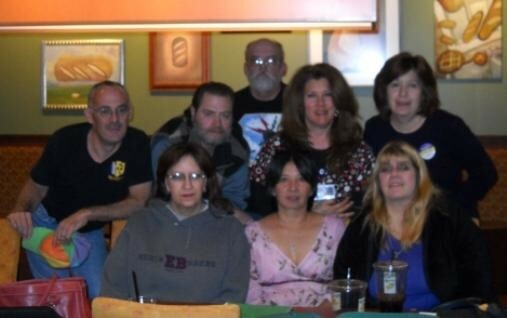 Next meeting is December 7, 2009 at Panera Bread, 1209 N. Belt Highway. at 6:00. Anybody that can come, please do!!! If you have any suggestions, let us know-this is your reunion!